Gerald Brosseau Gardner was born June 13th 1884 in Blundellands, England. He had two brothers and lived with his nanny most of the time growing up due to his asthma. Gardner claimed to be a hereditary witch, saying he was a descendant of Grissell Gairdner. She was burned as a witch in 1610. He initially made his living as a customs officer, but retired in 1936. He married his wife Donna in 1927. He traveled to the east after, where he became fascinated with ritual daggers and knives. This fascination led to his first book “Keris and other Malay weapons” in 1936.
when Gardner was back in England he met people who introduced him to witchcraft. 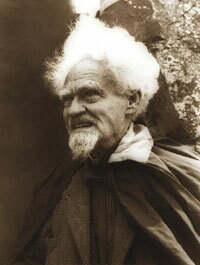 He later became involved with the Fellowship of Crotona and helped establish “the First Rosicruncian Theatre”, which produced plays with occult themes. Gardner was initiated into the New Forest Coven in 1939 and when he met Aleister Crowley in 1946, he also became and honorary member of the Orlo Templi Orientis. With the information he gathered within these groups, plus all her learned on his various archaeology trips; Gardner put together and published “A Goddess Arrives” in 1948. The next year he published “High Magicks Aid”, but he published it as fiction since witchcraft was still outlawed in England. The law was repealed in 1951. Once that happened, Gardner left the New Forest Coven to form his own. He took previous knowledge and made several changes to Crowley’s work and from 1954-57 him and coven initiate, Doreen Valiente, worked on material. The body of work(book of shadows) became the authority for what is now known as the ‘Gardnerian Tradition’. His last book was “the Meaning of Witchcraft”, which was published in 1959. Later, in 1963 Gardner met Raymond Buckland, who is responsible for introducing the Gardnerian tradition to America. Gardner established a new working practice, which involves what is now referred to as “Gardnerian Wicca”. During his life, and being the spokesperson in Britain for Wicca at that time, he was often criticized for making the craft so public. Many were worried that would eventually harm the craft and everything it stands for. Some still debate that to this day.